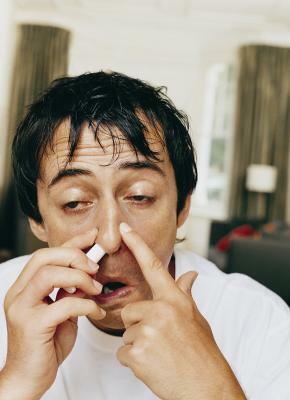 Emed > News > Nasal Sprays: Quick Fix Or Health Risk? Nasal Decongestant Sprays – Quick Fix Or Health Risk? Nasal tissues swell due to inflammation of the blood vessels and cause congestion, often exacerbated by excess mucus production. This condition can have a variety of causes: allergies, viral illnesses, hay fever, sinusitis, environmental irritants, or negative reactions to medications. Food allergies or food sensitivities are another common cause. For many, relief is often just a quick spritz away. The chemicals in the sprays quickly unclog the nose by constricting the blood vessels, shrinking the mucus membranes and reducing mucus formation. 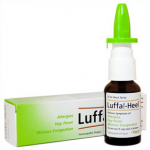 But quick relief provided by nasal spray decongestants like Rhinocort, Afrin, Nasonex, etc. comes at a price. Rebound vasodilation will cause the nasal passages to become more congested after the medication wears off, requiring repeated application. The blood vessels in the nasal lining quickly become tolerant to the drugs’ shrinking effects. Some people get trapped into a vicious cycle of overuse and dependence that feels like an addiction. Nasal sprays can actually thicken the mucus limiting the drainage of the sinuses leading to an infection. With months of overuse, the sprays can damage the mucus membranes. In some patients with severe cases, the inside of the nose looks like a chemical burn. Some types of over-the-counter decongestants, such as those commonly used by hayfever sufferers, were linked to rare birth defects of the digestive tract, ear, and heart, a research has found. Have plenty of liquids and keep hydrated. Eliminate refined sugars – refined sugar causes harmful bacteria to proliferate in the body, resulting in nasal congestion. Avoid dairy products – foods such as milk, cheese, yogurt, ice cream and butter all contain casein. It has a glue-like texture and histamine-creating properties, both of which cause increased mucus production and nasal congestion. Support healthy immune function with ArmaForce and probiotics. Reduce histamine response with Perilla, Baical Skullcap, Albizia, Quercetin with BioCeuticals Allergy Care. Sinus congestion is often caused by food allergies / sensitivities. Emed offers a simple finger prick Food Sensitivity Test to help you identify if you are having a food sensitivity immune response to any foods (it tests up to 96 common foods). Once you know, you can eliminate and compensate for these foods in your diet, which may help resolve your symptoms. Eucalyptus is an effective natural remedy for congestion associated with nasal inflammation. It contains the volatile oil eucalyptol, which triggers nasal receptors to increase mucus drainage. Eucalyptus also has muscle relaxant properties that may help relieve sinus infection symptoms like headache and sinus pressure. Add 2-3 drops of eucalyptus oil to a bowl of boiling water. Cover your head with the towel. Don’t bring your face too close to the water. Close your eyes and breathe deeply. Continue for 10 minutes. If you start to feel overheated or uncomfortable, remove the sheet. Neti pots, which you can find at many health food stores, have been used for centuries to help relieve nasal and sinus congestion and have become increasingly popular in recent years. A neti pot is a small vessel with a spout you insert into your nose that can be used to gently irrigate your nose and sinuses with a salt-water solution.